You are browsing the archive for British Cartoon Archive. The exhibition Cartoonists at the Olympics, featuring work from the British Cartoon Archive selected by community sporting groups, opens this weekend. It features Olympics cartoons from years gone by, including this 1948 Daily Mail cartoon about the Games in London that year by Ronald Niebour, who drew as NEB. On the evidence of the Diamond Jubilee weekend this could be a prediction of more “weather events” at this year’s Olympics. The exhibition can be seen a the Herne Bay Museum and Gallery in Kent. The British Cartoon Archive is based in nearby Canterbury at the University of Kent’s Templeman Library. It opens this Saturday and runs until September 2. Admission, which includes entry to the museum, is £2. Cartoons are inextricably linked to the seaside, so it was no surprise that when the new series of BBC Two’s Coast headed to Margate for a piece on the heyday of seaside landladies, they chose to illustrate that with a cartoon postcard. Being very well looked after, detail above, by Rupert Besley, a member of the PCO, which runs the Bloghorn, was featured to illustrate the stereotype “battleaxe” and her endless lists of rules. Bloghorn will gloss over Rupert’s comments – the typical insecurity of the cartoonist! – and say it’s a great cartoon, perfectly illustrating the subject matter at hand. You can see more seaside postcards in Margate in July, when a selection those digitised by the British Cartoon Archive goes on show. Bloghorn will have more on this nearer the time. This cartoon courtesy of the Cartoon Museum, the University of Kent and the trustees of the Giles collection. Bloghorn interviews Nick Hiley, curator of the exhibition Giles: One of the Family which is now on at the Cartoon Museum in central London. Who had the original idea for a Giles retrospective? 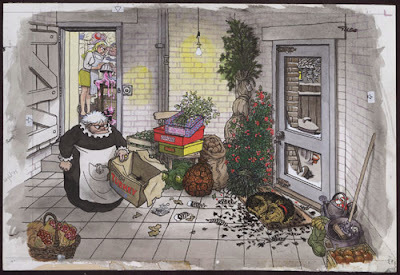 As soon as the Giles collection arrived at the British Cartoon Archive in 2005 it was clear that we needed to celebrate with a London exhibition, and the Cartoon Museum was the most appropriate place to hold it. We have spent the last eighteen months cataloguing and digitising Giles’ enormous collection of artwork, correspondence, and ephemera. This exhibition puts on display some of the things we have found. How long has it taken to put the Giles exhibition together? In a sense it has taken five years, as it was in 2003 that we began looking at the possibility of giving the Giles collection a permanent home in Canterbury, and making it accessible to the public and to researchers. The collection was in storage for ten years after Giles’ death in 1995, and it was always our aim to make the artwork available for exhibition and display once it reached the British Cartoon Archive. The actual exhibition planning and selection, and the writing of the catalogue, took about six months. How did the University of Kent get involved? We’ve been interested in the Giles collection for a long time. The University’s cartoon archive was set up in 1973, and after Giles’ death in 1995 the archivist approached the Cartoon Trustees, to whom Giles left his collection, with the suggestion that his artwork should come to Kent. At the time they had hopes that the collection might remain in East Anglia, where Giles lived and worked, but when we approached them again they were happy to donate the collection to us. A second exhibition – “Giles: Drawn to Suffolk” – is opening in Ipswich on November 8, and we do hope that a permanent display of Giles material may one day be established in Ipswich, where he had a studio for many years. What does promoting the work of a cartoonist who has died achieve? I hope that it brings the enjoyment of his work to new audiences, and gives existing fans a new insight into how he worked, by displaying his original artwork. Giles’ correspondence does include letters from other cartoonists and illustrators, expressing admiration for the way that he could arrange complex scenes in a simple visual way, so I hope that present-day cartoonists can learn something from seeing his work. He could draw cartoons of the Family where there is action across the whole frame, or on different floors of the house, but the focus is never lost. What would Giles have seen if he was watching the last-minute preparations for the show? He would probably have laughed a lot, and grumbled a lot as well. He would laugh because we reconstructed his studio, using all the easels, paints, pencils, etc. which came with the collection, even down to his glasses and his cardigan on the back of his chair. I’m sure he would tell us we had got it all in the wrong place! He would undoubtedly grumble, because he never liked his original artwork, partly because he was a perfectionist and partly because he regarded the printed cartoon as the finished work. His originals were drawn for reduction, and he thought that by comparison with the printed version they looked as if they had been “drawn with an umbrella”! They don’t seem like that to me, but to show that they are part of a reproductive process we have used specially made frames that show the whole artwork, including Giles’ notes and the blockmaker’s scribbles in the margins.